A few swipes is all it takes! 1. Brush up your brows. Instead of completely filling in the sparse areas of your inner brows, draw on thin flicks that mimic the strands of your hair while focusing on the tail part. If you have bushy brows, keep them in place by brushing them up with a clear brow gel. No need to use pigment to tame the hairs. Primers smoothen your face, filling in enlarged pores and wrinkles. Opt for a formula that has corrective technology like Revlon Youth FX Fill + Blur Primer for Face and Neck, which also has a smart applicator for easy use. 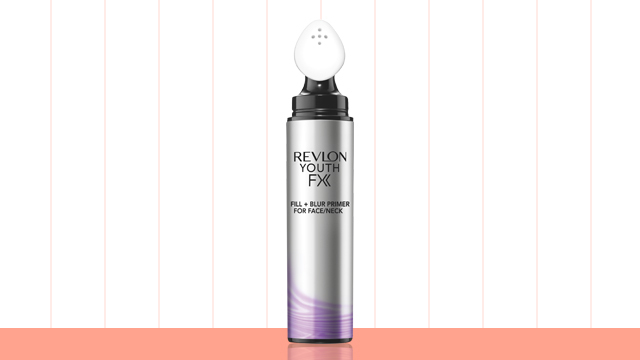 For wrinkle folds often found on the forehead, try Revlon Youth FX Fill + Blur Primer for Forehead, which specifically corrects and blurs creases on your face. 3. Use the right foundation. Sloppy foundation application can easily make women look older. However, some liquid foundations are really difficult to move around the face, resulting in an uneven, cakey base. Solve this problem by using Revlon Youth FX Foundation, a lightweight, easy-to-apply base that thoroughly evens out age spots and hyperpigmentation. 4. Brighten the inner corners of your eyes. Working girls tend to sleep late and wake up too early. It's a habit that results in dark circles, making you look tired and older. Combat this by trying a multitasking concealer that color corrects, brightens, and transforms the appearance of your crow's feet and dark circles. Plus points for Revlon Youth FX Fill + Blur Concealer, as it does all the aforementioned and zaps away zit spots in an instant for those days when you can't be bothered to sit on your vanity for too long. Blush adds a youthful glow to your skin. But its placement and formula can be a little tricky. Remember to go for cream-based blushers and apply them across the apples of your cheeks. Don't forget to include the lower parts of your face. Going overboard, however, will drag your face down. Rouge may give your lips the color they need, but don't go stingy on the gloss. Applying a layer of sheen can make your lips look plump and youthful. 7. Don't forget the lashes. You don't need to apply mascara every single day, but it helps if you curl them. This will open up your eyes, making you look more alert. To learn more about Revlon Youth FX, click here.